The Bruins had made it through a quiet summer without signing anyone of consequence. But with the team’s players returning to Boston this week for captain’s practice, the team finally made a move — signing one of its own. 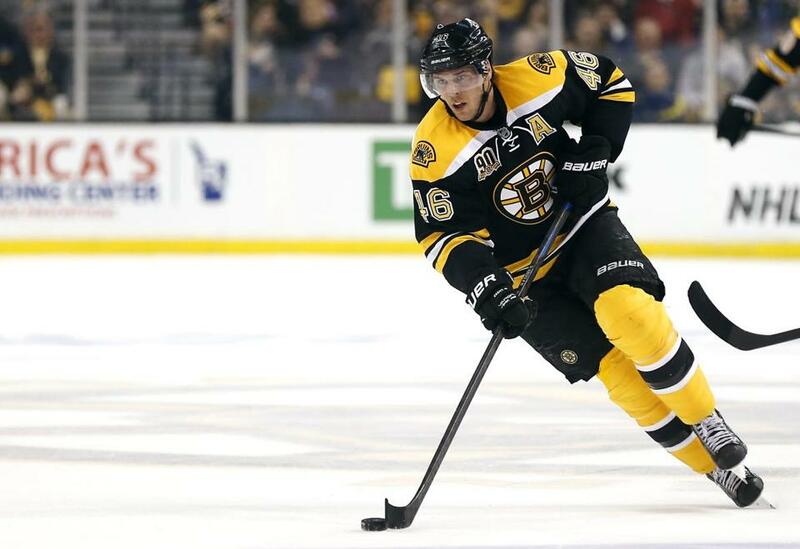 David Krejci, the team’s top-line center, agreed to terms on a contract extension with the Bruins, the Globe confirmed. The deal was for six years and $43.5 million, according to various reports, with the initial report of the extension coming from an outlet in the Czech Republic. The 28-year-old was under contract for this season for $5.25 million, but was set to become an unrestricted free agent at the end of the season. Instead, Krejci will be responsible for a $7.25 million cap hit starting with the 2015-16 season, according to the reports. That cap hit makes Krejci the highest-paid Bruin, exceeding the hits of goalie Tuukka Rask ($7 million), defenseman Zdeno Chara ($6.916 million), and fellow center Patrice Bergeron ($6.5 million). The Bruins and general manager Peter Chiarelli have done a good job of locking up their core players before they hit free agency, including the signings of Rask and Bergeron last summer. It also means that the Bruins will continue to be strong up the middle with their top two centers signed through the 2020-21 season (Bergeron is signed for an additional year). Part of not signing Jarome Iginla at the start of free agency, Chiarelli had said, was reserving money for players such as Krejci, to ensure that they remained with the team. Because with the salary cap set to rise, it was inevitable that Krejci was looking at a significant bump from his current salary. He got it. It was possible Krejci could have gotten more money had he hit free agency after next season, however. The NHL recently has seen mega-deals given out to the likes of Jonathan Toews and Patrick Kane by the Blackhawks. Over his seven full seasons in the NHL, Krejci has developed into a dynamic center, one who seems to come alive in the postseason. In his 504 career games, Krejci has 110 goals and 268 assists for 378 points, including 19 goals and 50 assists for a team-leading 69 points in 2013-14. Krejci, though, wasn’t his usual self in the playoffs, with just four assists in 12 games as the Bruins lost to the Canadiens in the second round in disappointing fashion. The 69 points were the second-highest total of Krejci’s career, behind the 73 he had in 2008-09. The team still has a large number of free agents coming up after the season, with Carl Soderberg, Gregory Campbell, Daniel Paille, Johnny Boychuk, Adam McQuaid, and Matt Bartkowski all unrestricted free agents. Dougie Hamilton will be a restricted free agent. And that doesn’t include Torey Krug and Reilly Smith, who the team has yet to sign for the current season. Milan Lucic and Loui Eriksson become unrestricted after the following season. Krejci, though, is now locked up for the next seven seasons, taking at least one headache away for Chiarelli.